On your blog, your entire blog is essentially the face of who you are. This is going to represent you, your company, your team, and how you run your business. 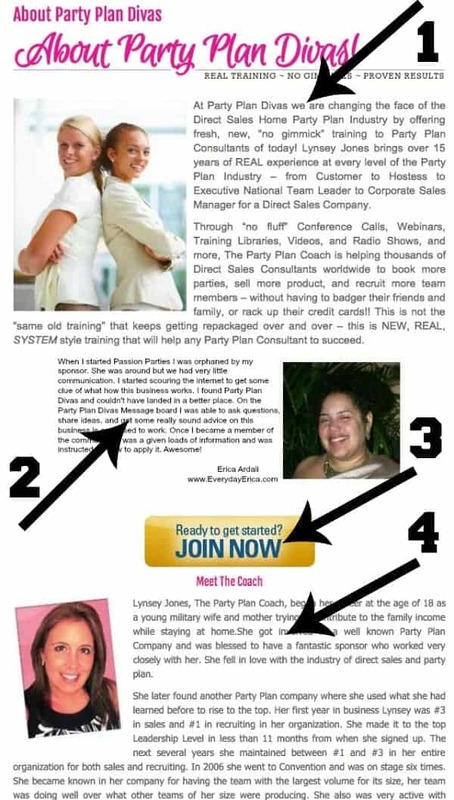 Having a phenomenal About Me or “Meet Me” page is a huge part of your readers first impression. This is your opportunity to showcase more about who you really are, pictures of you and your family, and highlight some of your favorite business-related materials. 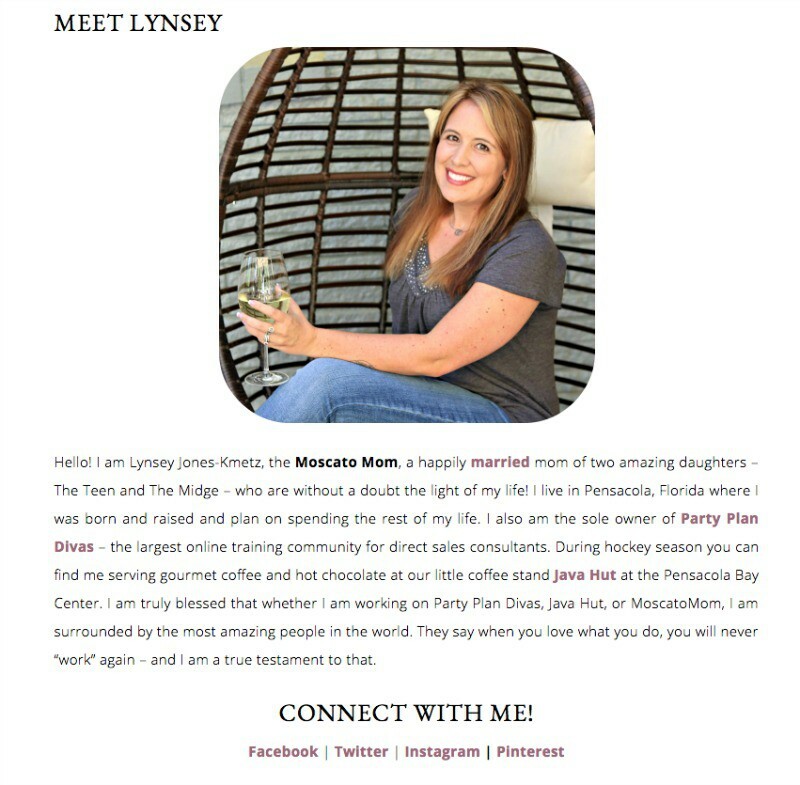 Now my business is a bit different, but my About page for Party Plan Divas is just as important as yours is. Let’s take a look at four elements of my About Page, and how you can set yours up similarly for a phenomenal first impression. The Party Plan Divas About Page has four distinct elements – an overview of the company, a customer testimonial, a place to join (buy!) and a personal about me as the coach. 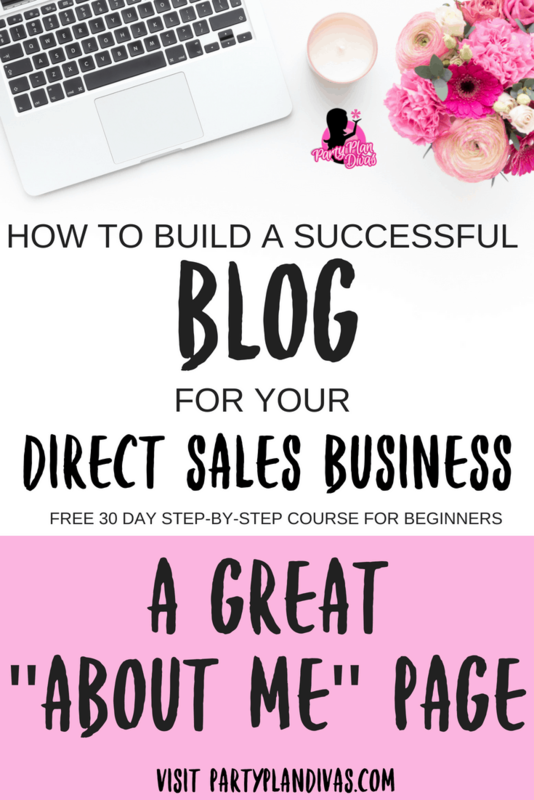 For your blog, you will have this exact lineup – only in a different order. Begin with your personal bio – tell us about your family, your life, where you live, what you love, hobbies you may have, etc. Include bright fun photos of you, your family, your pets – whatever. Remember to keep this all very very light and positive. Once you have introduced yourself, introduce your business. Why did you join? What are your dreams? What have you achieved that you are proud of so far? How can a reader become a part of your business – and why should they? Next include a customer testimonial or review as well as a link to purchase a product, or to get more information about joining your team! You can then finish with some details in your own words about what makes your company the best ever. You can also put a call to action for following you on your social accounts, link to you replicating shop page, and more! You want your “About” to show off your personality and really help your readers get to know you and feel like they are connecting with you. Your “About Me” page should not be so long that people have to scroll and scroll to find information. Remember to keep it short and sweet, include bright and cheery pictures, and keep it very positive and inviting. Also, make sure that your About page is visible on a menu or top of your blog so it can be easily seen and clicked on. Homework: Write or re-vamp your About Page using the top tips we have shared with you here. And that photo? Is it current? If not – Change it up! Use some of these tips to guide you. Your “About” Page: Brings a personal touch to an anonymous, online connection and allows your personality to shine through. It creates a sense of knowing, a sense of trust. Include A Photo: This is YOUR space! Your readers want to see YOU. Not just your kids, husband, pets, yard… YOU. Who You Are And What You Do: It’s called an “About” page for a reason 🙂 Don’t just write a boring autobiography – let your personality shine through! Your Visitor’s Needs: What can the reader get from visiting your blog? What is it about? How does it help them / solve their problem? Include Contact Information Include a link to your contact form or add a new contact form on the About Page below your info. Make sure to list YOUR email address as well so that people can email you without having to fill out the form. Be Social: Invite readers to connect with you in your social circles: Facebook, Twitter, Pinterest, LinkedIn, Google+ etc. A Call To Action. What do you want your visitors to do after they’ve read about you? Include a prompt to subscribe to your feed or your newsletter or connect with you on Facebook and Twitter. Keep It Current. Keep It Concise. Keep It Professional. Keep it YOU!